This month’s post is dedicated to the topic of Work in Progress or WIP. In my site visits to Boat Builders and Boatyards across the country, I realized how many professionals in the industry don’t know what work in progress is, why they should track it, and what this valuable reporting metric can do for their company. So ~ let’s start from the Top. What is Work in Progress (WIP)? Work in Progress (WIP) is billable labor, materials, subcontractors and expenses on a build or refit project that have not yet been billed on a customer invoice. It is work that is already completed, partially completed or expenses already incurred, but it is in the progress of being billed. How Do We Calculate WIP? We calculate Labor WIP using the employee’s current hourly rate plus the cost of benefits for that employee. We calculate Material WIP using the actual cost and amount of materials used on the project. An example of this is a technician that uses a half a gallon of Epoxy Resin that cost the company $60.00/gallon generates $30.00 WIP. WIP is recognized as an asset on the balance sheet. I have worked with many yards and builders that handle WIP in different ways from an accounting perspective and that is fine as long as they are tracking it. Some companies make adjusting journal entries to report the change in their WIP balance after each billing cycle. This is a manually calculated entry and may be subject to estimating and/or calculating errors. Depending on the accounting software used, WIP can be accrued and reported on financial statements automatically. This will eliminate the need for the manual journal entry and reduce the chance of errors. Some programs calculate WIP at retail and others at cost. WIP provides an additional piece of information for project managers to evaluate the progress of their projects. To effectively manage a project’s budget/estimate, project managers must know what has been billed and what is available to bill (WIP). Project managers can utilize this information to proactively manage a project’s budget, help guide billing, and help identify any potential overruns. I have worked with a couple of companies that routinely evaluates the aging of their WIP. Projects with WIP that are 15 or 30 days or older, for example will prompt the questions of “why have these projects not been billed?”, “is it billable?”, and “is it collectable?” Often, this can indicate a potential red flag in either the project estimate, project management, or project billing procedures. The important thing is you have an eye on it have the opportunity to proactively manage the WIP balance. Do I have to track WIP? Additionally, choosing to not report WIP on financial statements understates the current assets and overstates the Costs of Goods Sold on a company’s financial statements. This can impact a company’s opportunities when applying for loans, line of credits or other investment options. Like any other cost, the data that goes into calculating WIP must make sense and must be managed accurately and efficiently. Many, but not all Accounting Software Solutions will help you and your team track WIP automatically and provide relevant, accurate and timely reports so you know where you are at any given point in time. 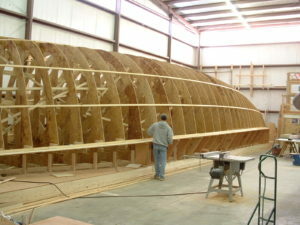 WIP, in my opinion, is an additional piece of valuable information that no Boat Yard or Boat Builder should be without!